Joey made Laurice wait 10 years before they wed, j/k, well somewhat. 🙂 This awesome couple have been together since they were teens and it seems like their love only gets stronger as time goes on. I immediately bonded with Laurice and Joey, because of their fun, upbeat, and silly personalities. Once they came to see me, they knew they wanted Lighten Films, because we were the perfect fit and had a great connection Their wedding was exactly how I imagined it to be, which was fun, heartfelt, and awesome. They married and celebrated at the beautiful Siena Golf Club on a lovely Saturday in Spring. D. J. Starlene from Sound Fusion Entertainment kept the party going all night. I also had a great time working with Maolo Photography as we captured their day. Thank you Laurice and Joey for being you and allowing me to capture your essence and immortalize it. 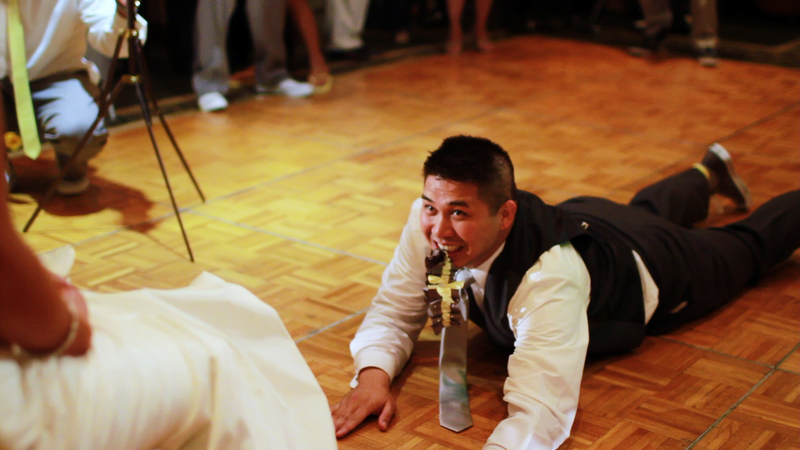 Joey getting down and dirty to remove the garter. Terrence you just keep getting better and better! Joey and I loved every minute of this highlight reel. You captured all the funny and loving moments of that day. We are blessed to have found such a passionate and dedicated person to do our wedding video. Thank you for hard work!